Pack some sandwiches, fill the cooler with ice, put the kids in the car, we are going on a picnic! Nothing says summer like a picnic in the park, at the ball field, or in the backyard. 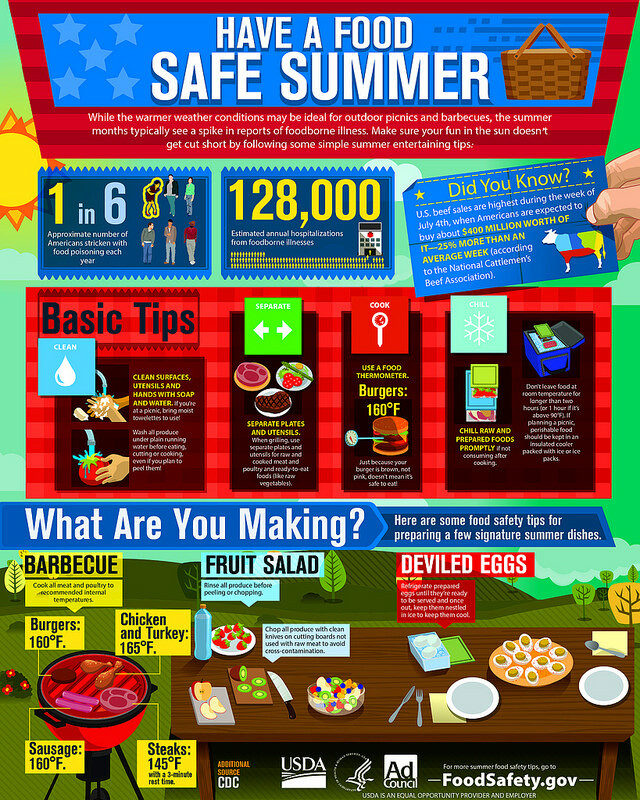 Unfortunately, warm temperatures help bacteria to grow faster and if your food is not handled safely, you can end up with a foodborne illness. Follow the steps below to help keep your family and friends safe. Picnic food is handled by a lot of people and requires a lot of handling during preparation. Ex. Cutting fruit, making hamburger patties, putting together salads. Food is not cooled quickly after it is cooked. Many times food is precooked and a large amount is prepared. The food must be cooled quickly in the refrigerator, and immediately after it is cooked to prevent bacteria growth. The food should be placed in shallow containers, no deeper than two inches, in order to help it cool quickly. Equipment to keep cold food cold and hot food hot is not used at a lot of picnics and the food sits out for long periods of time. The longer food is stored at outside temperatures, the more bacteria can grow. Wash your hands before preparing food and after any contact with raw meat. Use clean utensils and containers. Do not put cooked food in a container that held uncooked food without first washing the container with hot, soapy water. Prepare picnic foods no earlier than the day before the event unless the food will be frozen. Thaw frozen foods in the refrigerator and not at room temperature. Wash melons before cutting them because bacteria can live on the rinds. Keep cut melon in the refrigerator. Keep cold food cold (41°F). Pack cold foods in a cooler with plenty of ice or frozen gel packs. Place the food in watertight containers and completely immerse it in ice in the cooler. Transport your cooler inside your car because the temperature in trunks can get very hot. Keep your cooler in a shady area with a blanket over it for extra insulation when you arrive at the picnic-not in a closed up car. Keep hot foods hot (135°F). If you bring take out food such as fried chicken, keep it hot on your trip and eat it within an hour of purchasing. Wrap hot foods in towels and newspaper and carry it in a box or heavy paper bag. Keep the food warm on a lit grill or eat within an hour. If you know that you will not be able to keep foods cold or hot, bring non-perishable food such as peanut butter and jelly, fresh fruits and vegetables, pretzels, unopened canned meat. Pack moist towelettes if your picnic site will not have running water to use for handwashing. Make sure to bring enough utensils and dishes if you are going to be cooking. Cooked meat should never be placed on dishes that held raw meat. Proper washing at a picnic may be difficult so consider bringing disposable items for food preparation. Remember to keep cold food cold and hot food hot. Food should be left out for no more than two hours. If the temperature outside is 90°F or warmer, food should be out no more than one hour. Grilled food should be eaten shortly after it is cooked. Keep foods covered to limit the exposure to insects. Place leftovers that have been out for less than two hours immediately in a cooler or throw them out. If there is a doubt of how long the food has been sitting out, throw it out. There must be ice in a cooler to keep food cold-cold, melted ice water is not cold enough and food should be thrown out.